"WHAT YOU WILL LEARN: In this chapter you will study Greece- home to one of the great ancient civilizations. Essential Question: What factors shaped government in Greece?" 6) Once you are logged in, go to BrainPOP. 7) In the search box, type in Greece. 8) You will find several excellent videos including Athens, Democracy, Greek Gods, Homer, and the Olympics. Students will engage with a magazine article that will highlight the location and important regions surround Ancient Greece. What areas surrounded Ancient Greece? What were some important things to know about Crete? What things has Greece developed that we still see and use today? Has anyone every traveled near there before? What would be different about living in Europe? We will then discuss how all of these cultures have influenced our world so far. Students will turn to page 2 and 4 of the packet. We will read these sections together individually, partner reading, and group read aloud. Once we have discussed the various aspects of these pages, students will be asked to answer the first 5 questions in the note packet. If they have time, they may begin their homework for the next day. Are students able to accurately answer the questions in the note packet? Students will be assessed on their active participation throughout the class and their engagement with the project. Students will be assessed on their effort and accurate information within the note packet. Read pages 95 and 96, answer Fill in the Blank section on page 97.
o What have we already learned about Ancient Greece?o Does this remind you of anything in your life? What were some powerful city-states? o What have we already learned about Ancient Greece? Does this remind you of anything in your life? What are some important aspects of Greek Arts and Architecture? 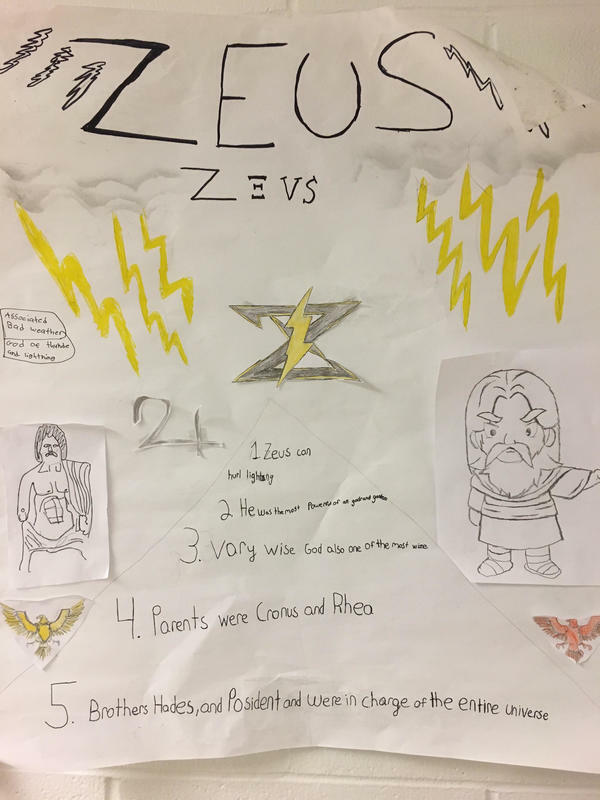 Homework Monday, October 22, 2018: Begin thinking of the Greek God assignment – what would you like your poster to look like? What have we already learned about Ancient Greece? Does this remind you of anything in your life? Have you heard of the Greek gods and goddess before? What are legends and myths? How did the myths shape the Greek culture? What is a legend or a myth? How did this shape Greek culture? How do these things still impact our world today? What things did you notice in the video that you hear today? 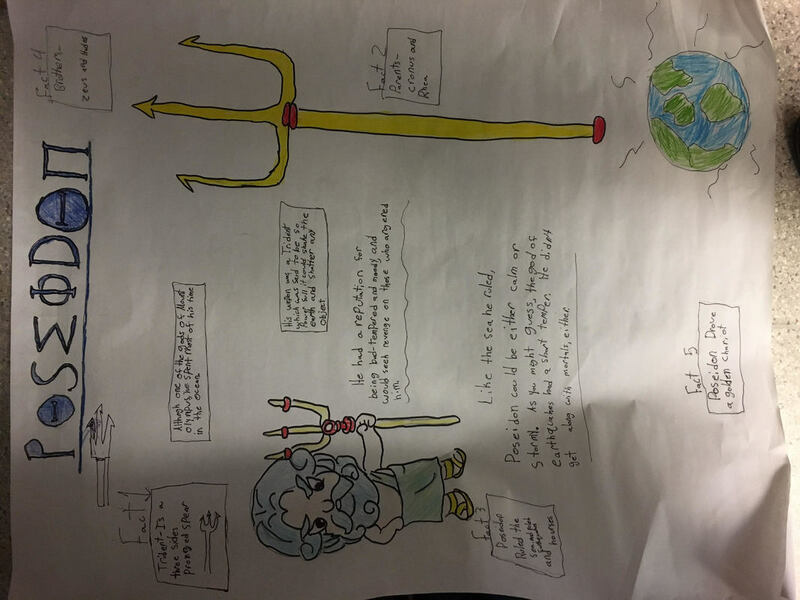 Homework Tuesday, October 23, 2018: Begin thinking of the Greek God assignment – what would you like your poster to look like? What have we already learned about Ancient Greece? What were some of the aspects of Greek culture? What were the various things that Greece culture had that we still see today? What was different between the Olympic games back then and now? How do you feel about those things? What things have you learned so far that are still existing in our world? What other cultures did Greece influence? What do we use or have that was influenced by the Greeks? How have Greek traditions and culture shaped out world today? What things do you notice? What do you still have questions about? Students will be encouraged to start studying their guided question packet for their test on Monday, 10/29. What was important about your god/goddess? What were they the god/goddess of? What was some of the history of your god/goddess? What are some fun facts about your god/goddess? What are some of the beliefs that you have that might be similar or different to what the Greeks believed? Are students able to find the necessary information on their Greek god/goddess and are they able to articulate/create it in a way that is organized and accurate? Even though this is a group project, students will be given individual grades if necessary for effort, collaboration, engagement, etc. What are some things you notice in this picture? Students will describe the significance of Greece’s geography and its nearness to the sea. The teacher will go through the slides of the power-point. The teacher will explain each slide, and identify key notes to take and write down in notebooks. The teacher will provide a video about the Geography and City States of Greece that students will take notes on. How would you respond if you liked this classmate? How would you respond if you DID NOT like this classmate? Would you ever want the power and/or authority? Why or why not? Students will explain, identify, and present different forms of democracy and government over time in Greece. Students will be broken into three different groups. Each group will do a skit depicting each one of the Main Ideas discussed on pages 236-239. Students will describe what a democracy is by performing in a skit. Students will write their own script and act it out in front of the class. Two class periods to work on this. This learning activity is an example of Kinesthetic learning that will benefit kinesthetic and hands-on learners. Why did the Greeks tell fables? First, the teacher will complete the first step on the SmartBoard and then the students will complete the same step. Gradually, the students will begin to do the steps individually. Make sure to incorporate color and pictures AS WELL AS words that show what is the same and different. · To begin chapter 8, students will make a list of all that comes to mind when they think of Greek Civilization. Students will write their list in their notebooks. After about five minutes, students will share their ideas with the class. · Students will flip through chapter 8, pages 224-255. · Students will make a list of all of the features that they see on pages 224-255. · Students will make two columns in their notebooks. The heading is “Features.” On the left side of the notebook they will list the feature. On the right side of the notebook they will note whether the feature is a visual feature or a text feature. A visual feature is something that is a visual image; a text feature has words. · Read pages 226-227 as a class. Answer questions 1-2 together. · If there is still time, students can work on their “Hall of Fame” essay. As a preview to the chapter, students have already begun to peruse the pages of chapter 8. In groups of two or three, students will jot down notes about what they already know about Ancient Greece. They will also take notes about questions that they have a about Ancient Greece. Yesterday, students have already stated the text and visual features found on pages 224-225 in the textbook. In pairs or groups of three, while analyzing pages 224-225, students will notice and decide: what are the three main topics that we will study in this chapter? Students will create a poster with the three different parts: 1) what I know, 2) what I want to know, and 3) list the three main topics that we will study in this chapter. They can design the poster in which ever way they see best. We will share the posters with the class. Watch video "Origins of Western Culture," History Channel. Section 1: "Geography and the Early Greeks"
"The Big Idea: Greece's geography and it's nearness to the sea strongly influenced the development of trade and the growth of city-states." As a review, students will notice and state the the three topics that we will study that were found on the posters made Friday. Review: what are the three main topics that we will study in this chapter? Students will read pages 228-230. Students will also look at the map on page 229. Answer these questions with bulleted notes in your social studies notebook. Please state the paragraph and page number from which you find your evidence. Mrs. Looney will model how to take bulleted notes by answering the first question with the class. If you lived in Greece, what could you do to make a living? How does the geography of Greece influence the economy? How did the mountains affect the location of Greek settlements? Students will receive the RACE Graphic Organizer and Writing Prompt Graphic Organizers to help them answer the Reading Check questions. Mrs. Looney will continue to model how to read the features and text in the social studies textbook. Mrs. Looney will model how to use the RACE Graphic Organizer and the Writing Prompt Graphic Organizers using the Reading Check question found on page 230 in the social studies textbook. As a class, we will read pages 228-233. Mrs. Looney will continue to model how to use the RACE Graphic Organizer and the Writing Prompt Graphic Organizers. As a class, we will continue to read pages 228-233. On pages 230-231, students will use the photos and the headings to determine what the important roles of the Minoans and Mycenaeans were. In pairs, students will review pages 232-233 and answer the Reading Check question found on page 233: "Why did the Greeks develop city-states?" Students will fill out the RACE Graphic Organizer using the Writing Prompts Graphic Organizers to answer the question. Students will answer the question on the RACE Graphic Organizer sheet. Homework Due Tuesday, : Answer the Reading Check question found on page 233: "Why did the Greeks develop city-states?" Students will fill out the RACE Graphic Organizer using the Writing Prompts Graphic Organizers to answer the question. Students will answer the question on the RACE Graphic Organizer sheet. THIS IS FOR A GRADE! Classwork, Monday, : Main idea: The Greeks created city-states for protection and security. Students will look at the features found on pages 232-233. Before we begin to read pages 232-233, what questions might we have? Look at the map on page 232. What different facts and ideas does this map tell us? As a class, we will read pages 232-233. Individually, students will make a bulleted list of important facts (found on pages 232-233) that describe Greek city-states. Answer the Reading Check question found on page 233: "Why did the Greeks develop city-states?" Students will fill out the RACE Graphic Organizer using the Writing Prompts Graphic Organizers to answer the question. Students will answer the question on the RACE Graphic Organizer sheet. This is due tomorrow (Tuesday). This is for a grade. Homework Due Wednesday, : Prepare for your group's skit and presentation. Social Studies test will be on Monday, October 5, 2015. To prepare for the social studies test, students were given the Study Guide for the Chapter 8: "Ancient Greece" Social Studies test. The Study Guide includes important vocabulary words and definitions to be studied. The Study Guide also includes Vocabulary Builder Worksheets Sections 1, 2, and 3. These Vocabulary Builder Worksheets are to be used to practice and prepare for the test. The answer sheet for the Vocabulary Builder Worksheets are included in the Study Guide. Study for the test. Classwork, Tuesday, : Government in Athens. 1. Aristocrats and tyrants ruled early Athens. 2. Athens created the world's first democracy. 3. Ancient democracy was different than modern democracy. Students will read pages 236-239. Students will be broken into three different groups. Each group will do a skit depicting each one of the Main Ideas found above and on pages 236-239. Students will begin studying for the social studies test which will be on Monday, October 5, 2015. Homework Due Thursday, : Complete question number 4 on page 241 in your social studies notebook. Using the information found on pages 236-241, make a three section compare and contrast t-chart to compare and contrast the three types of government. Each student should list four bullets for each section. Students were given the Study Guide for the Chapter 8: "Ancient Greece" Social Studies test. The Study Guide includes Vocabulary Builder Worksheets Sections 1, 2, and 3. These Vocabulary Builder Worksheets are to be used to practice and prepare for the test. the answer sheet for the Vocabulary Builder Worksheets are included in the Study Guide. Study for the test. Classwork, Wednesday, : Groups will present their skit. Groups will present their skit. Students will reread the information given on pages 236-239. Complete question number 4 on page 241. Using the information found on pages 236-241, make a three section compare and contrast t-chart to compare and contrast the three types of government. In a bulleted list, describe the greatest achievements of ancient Athens. Homework Due Friday, : Study for the test. As a segue into the next section of our chapter, we will watch the BrainPop video "Athens." Students will make a "check" for of all the times that the video talks about something that they have already learned in this chapter. Students will also make a note of the topics that we have not yet discussed. We will move into Section 3 of our chapter: "Greek Mythology and Literature." Together as a class, we will skim through and look at the features found on pages 242-253. Homework Due Monday, : Study for test. Chapter 8 Test is on Monday. See above for the study guide. We will watch the "How to Prepare for a Test" PowerPoint. We will discuss other study skills. If there is time, students can begin studying for the test. As extra credit, students may finish filling out the study guide that was handed out in class or may create flash cards with the vocabulary words and definitions. Homework Due Tuesday, : Make corrections to your test. Students can make corrections to their test to increase their test score. When making corrections, students must write the page number from where they found the correct answer in the textbook. If students choose to make test corrections, they must have the correct answers and page numbers written down and turned in at 8:00 on Tuesday morning. Students will complete the chapter 8 social studies test. Students received their tests back and their grades. Students can make corrections to their test to increase their test score. When making corrections, students must write the page number from where they found the correct answer in the textbook. TO GET THE REVISED TEST SCORE, STUDENTS MUST BRING THE CORRECTIONS IN TO MRS. LOONEY FIRST THING TUESDAY MORNING OR DURING WRITING CLASS. NO EXCEPTIONS WILL BE MADE. We will go over the answers to the test. The next chapter that we will be studying is Chapter 9: "The Greek World." Check out the next chapter in our social studies textbook to get a head start on the chapter. Be sure to look over vocabulary words, timelines, headings, and other visual and text features. Homework Due Friday, : Greek Word Origins, pages 226-227, and definitions (see below). Classwork, Thursday, : Greek Word Origins, pages 226-227. As a class, we will go over page 226 in the social studies text book. Students will then look at words 1-8 on page 227. Students will complete the "You Try It!" activity at the top of the page. "Use the chart on the opposite page (page 226) to find a Greek root or roots for each of them. How do the words' roots relate to their definition?" Answer these questions in your social studies notebook. In your social studies notebook, write the definitions of the following words: geography, acropolis, democracy, tyrant, oligarchy, mythology. After writing the definitions, write the words in a sentence. Use the glossary at the back of the social studies textbook to help you with the definitions. You may also refer to the chapter if you need help. Homework Due day, : Read pages 228-231. Answer the questions below in your social studies notebook. As a review, in pairs, students will notice and state the text and visual features found on pages 224-225. Answer these questions with bulleted notes in your social studies notebook. Please state the paragraph and page number from which you find your evidence. Pages 230-231: Use the photos and the headings to determine what the important roles of the Minoans and Mycenaeans were. Homework Due Thursday, Friday, and Monday, : Read pages 228-233. Work on and complete the "City-states Questions" Essay which is due Monday. Complete on loose-leaf. Students were given the Study Guide for the Chapter 8: "Ancient Greece" Social Studies test. The Study Guide includes Vocabulary Builder Worksheets Sections 1, 2, and 3. These Vocabulary Builder Worksheets are to be used to practice and prepare for the test. the answer sheet for the Vocabulary Builder Worksheets are included in the Study Guide. Study for the test. Students will read pages 228-233: Section 1: "Geography and the Early Greeks." Students will answer questions 1 (a, b, and c), 2 (a and b), 3 (a and b), and question 4 (Write a paragraph summarizing the influence of geography on city-states) found on page 233. On loose-leaf, students are to answer these questions in essay form. I would suggest that you write an introduction. Paragraphs 2, 3, 4, and 5 should answer questions 1, 2, 3, and 4. And be sure to add a conclusion. Be sure to use the writing rubric and outline to guide your work. Paragraph 1: Introduction. Look at "The Big Idea" found on page 228. ("Geography and its nearness to the sea strongly influenced the development of trade and the growth of city-states.") I would suggest that you take the "Big Idea" and reword it into your own words to use in your introduction. Paragraph 5: Question number 4. Write a paragraph summarizing the influence of geography on city-states. Paragraph 6: Conclusion. Rewrite your introduction to summarize the essay that you wrote and to tie together all of the facts that you included in your essay. Homework Due day, : Pages 242-247, answer questions. We will read a Greek myth and a fable in class. Students will read pages 242-247. Answer the following questions in your notebook. BE SURE TO WRITE YOUR ANSWERS IN COMPLETE SENTENCES. BE SURE TO RESTATE THE QUESTION IN YOUR ANSWER. BE SURE TO USE DETAILS FROM THE TEXT TO ANSWER THE QUESTIONS. We will read another example of an ancient Greek myth. We will read examples of sixth grade myths and hero's journey narratives. We will answer the questions from the past two days of homework. Students will be sure that they are adding several details from the text. If students are using direct quotes from the text they will state the page from which they took the quote. Homework Due day, : None. Homework Due Wednesday, , : Read pages 263-265 in your social studies textbook and complete pages 7-10 in your Greek Notebook. Homework Due Friday,: Read pages 269-271 in your social studies textbook. You will complete pages 15-18 in your Greek World Notebook.